Kansas City won the first game of Saturday's doubleheader as they touched up Yankees starter Luis Severino for six runs on eight hits and a walk, with five strikeouts, in 4 1/3 innings. Giancarlo Stanton had a two-run homer in the fifth, and with the Yankees down 6-4 in the sixth, he hit a deep fly out to right that would have cleared the bases if it came down. The Yankees cut it to 6-5 in the seventh on a Gleyber Torres RBI double, but K.C. responded with three in the eighth and one in the ninth. In the second game, the Yankees jumped out to a 3-1 lead early, but the Royals got a run each in the fifth, sixth, and seventh to take the lead. In e eighth, the Yankees got a game-tying homer from Greg Bird, and Aaron Hicks gave them a 5-4 lead with a sacrifice fly. Dellin Betances (2-3) earned the win, while Aroldis Chapman racked up his 27th save of the season. This game was a pitchers' duel between two of the best lefties of the era, as Andy Pettitte of the Yankees (7 IP, 0 runs, 7 hits, 3 walks, 4 K's) and Chuck Finley of the Angels (8 IP, 0 runs, 4 hits, 4 walks, 9 K's) kept the game scoreless deep into the night. In the tenth, Angels reliever Rich DeLucia walked Derek Jeter, Paul O'Neill and Bernie Williams to load the bases. In came Mike Holtz with the bases loaded and none out to face Tino Martinez, who drilled a two-run single to give the Yankees the lead. That was all for Holtz, and in came Shigetoshi Hasegawa, who allowed a sacrifice fly to Chad Curtis to make it 3-0. 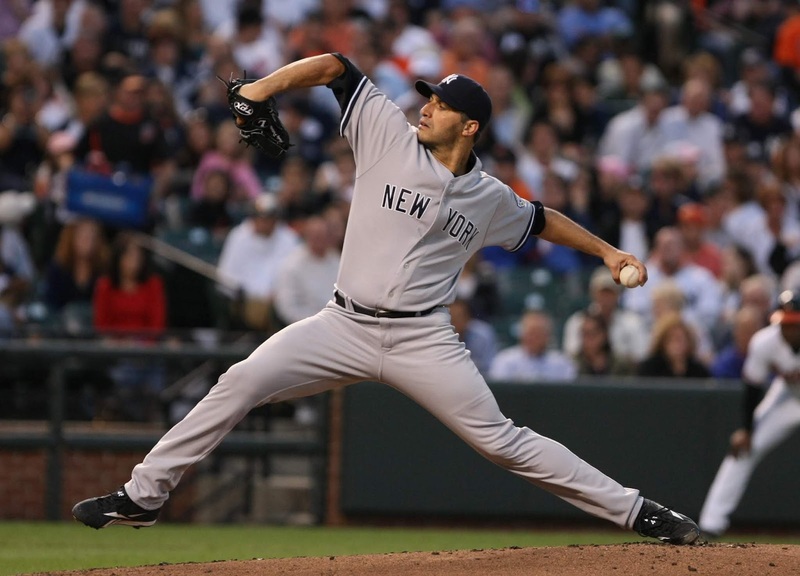 Ramiro Mendoza threw two shutout innings in relief of Pettitte to earn the win, while Mariano Rivera worked around two hits allowed in the 10th to earn his 28th save of the season. The Yankees got on the board in the second when Shane Spencer got an RBI double, and they added to it in the fourth when Jorge Posada and Scott Brosius hit solo homers to make it 3-0. In the bottom of the fourth, Seattle got on the board when Alex Rodriguez led off the frame with a home run, and Chad Curtis that run back with an RBI single in the fifth. In the Seattle seventh, Edgar Martinez and David Segui hit back-to-back homers to make it 4-3. Posada hit another homer in the eighth to make it 5-3 and put the game away. Hideki Irabu earned the win, as he went seven innings, allowing three runs on six hits and a walk, with six strikeouts, to improve to 10-4. Mariano Rivera pitched a perfect ninth to earn his 29th save. Jeff Fassero threw a complete game for Seattle, as he allowed five runs on 12 hits and three walks, with eight K's, in the losing effort, as he fell to 10-7. Where they stand: With the split of the doubleheader Saturday, the 2018 Yankees (66-37) dropped to ten games off the pace of the 1998 team, which was 76-27 through 103 games.